Over the past 24 years, mining companies discovered 1.66 billion ounces of gold in 217 major gold discoveries, SNL Metals & Mining's 2014 edition of Strategies for Gold Reserves Replacement shows. While that sounds like a significant amount of gold, it falls short of the 1.84 billion ounces produced over the same period. 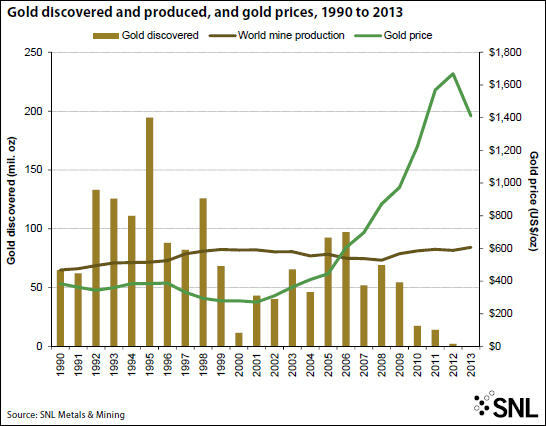 In addition, the amount of gold discovered and the number of major discoveries (defined as any deposit with a minimum of 2 million ounces of contained gold) have been trending downward over time, from 1.1 billion ounces in 124 deposits discovered during the 1990s to only 605 million ounces in 93 deposits discovered since 2000. The amount of potential production from these major discoveries is particularly concerning when looking at the discoveries made in the past 15 years. Assuming a 75% rate for converting resources to economic reserves and a 90% recovery rate during ore processing, the 674 million ounces of gold discovered since 1999 could eventually replace just 50% of the gold produced during the same period. However, considering that only a third of the discovered gold has been upgraded to reserves or has already been produced, and that many of these deposits face significant political, environmental or economic hurdles, the amount of gold becoming available for production in the near term is certainly much less. The length of time from discovery to production is expected to continue trending higher: 63 projects now in the pipeline and scheduled to begin production between 2014 and 2019 are expected to take a weighted-average 19.5 years from the date of discovery to first production. There are many reasons for the longer development times, including the need for increased and more detailed feasibility work, hurdles imposed by greater social and environmental awareness, longer and more demanding permitting processes, increased need for infrastructure and processing capacity due to lower ore grades and/or more remote locations, limited availability of capital, and scarcity of experienced personnel. 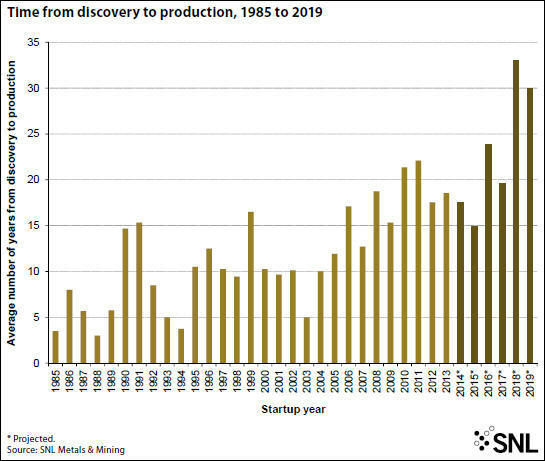 As it can take several years of exploration for a new discovery to be defined, it is too early to tell whether the surge in discovery-oriented exploration since 2010 has moderated the downward trend in the number and richness of new discoveries. The tough financial environment for junior explorers over the past two years suggests that the longer-term downward trend in discoveries will likely continue for at least the next few years. Further details on discoveries, the gold development pipeline and capital cost spending can be found in the 2014 edition of SNL Metals & Mining's Strategies for Gold Reserves Replacement.